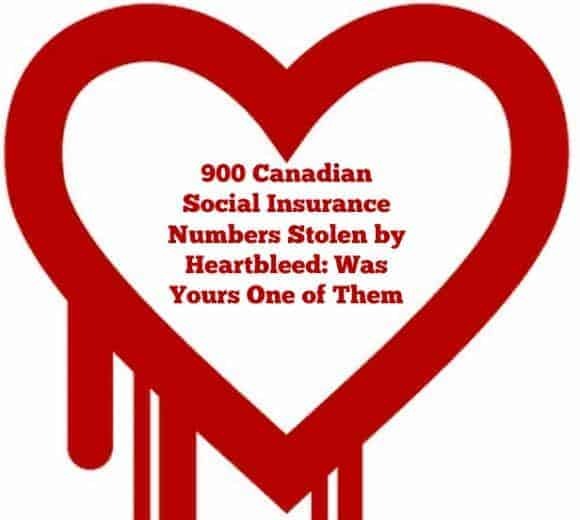 The Canada Revenue Agency (CRA) Announced that 900 SIN (Social insurance number) were compromised due to that Heartbleed! That’s HUGE! SIN is the backbone of the North American society, you need for everything: work, loans, job, tax filing!! Having a SIN stolen can lead to identity theft, unwanted debt, unwanted records, loss of job: a nightmare! I was in shock when I heard the news! What if my SIN or my children’s SIN were stolen? What should I do? What Can I do? What should I do in the future? I cannot change my SIN like I change my password, now can I? After all, Heartbleed isn’t the only issue that can arise and cause a stolen SIN, now is it? Worried about my SIN after Heartbleed, what did I do and what you may consider to do? You can cry! Seriously, it helps relive the emotions but you still need serious actions! I have the Equifax monthly report. I pay $15 and get instant alerts of activity in my credit report. I am so scared about identity theft that I am happy to pay that monthly fee. Even if I have the alerts, I went and checked my online report for safety of mind! Don’t feel obligated to sign up for monthly alerts, it is a personal choice but running a credit report once in a while is good and this is a great idea to do when the tax agency announces that 900 SIN are compromised. In this digital era, we receive tons of unwanted emails and spam. I receive at least 50 emails a day asking me for personal information, bank information and asking me to open attachments. I delete those emails and you should consider deleting them too. Before deleting I mark them as spam! It helps reduces the unsolicited emails and risk of spam. Check any unusual bank statements, any other insurance or other statements you may receive. I mean. I know that most of us have electronic statements that we forget to check and some of us have printed statements that end up as scrap paper for our kids’ drawings. Seriously, though, take the time to check them over! It will avoid any future nightmares. While some officials say it is useless to change password because Heartbleed is a bug, I updated my password and I did not choose my kids names or my mothers maiden name. I chose a complicated one that is easy for me to remember and hard for hacker (I hope). It’s a good idea to change your passwords occasionally anyway, even if you don’t suspect that your identity has been stolen. As for Heartbleed, many social networks, banks and so on are patching their software. Once that patch is in place, change your passwords. Any other suggestions for a compromised SIN? Are you taking measures to protect yourself after Heartbleed? We’d love to hear your thoughts. Yikes, I really hope that you aren’t personally affected. I am always worried about someone trying to steal my identity. I do pull my credit report using the free ones once a year.